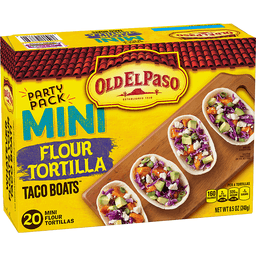 Old El Paso™ Mini Flour Tortilla Taco Boats™. Established 1938. Party pack. 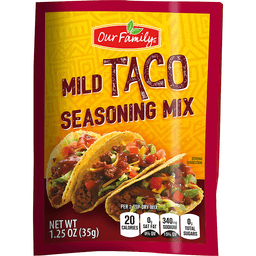 Per4 Tortillas: 160 Calories. 2g Sat fat, 10% DV. 320mg Sodium, 13% DV. <1g Sugars. Net Wt. 8.5 oz (240 g). Whatever floats our taco boat! Partially produced with genetic engineering. Tortillas do not need to be refrigerated. Learnmore at ask.generalmills.com. Whatever floats your taco boat! 100% Recycled paperboard™. how2recycle.info. Patent: generalmills.com/pat. Questions or Comments Call 1-800-300-8664 Mon - Fri 7:30 a.m. - 5:30 p.m. CT information from the package will be helpful. Old El Paso Consumer Services, P.O. Box 200, Minneapolis, MN 55440. 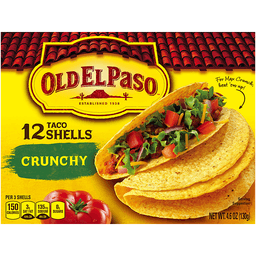 For great recipe ideas Visit us at: www.oldelpaso.com. © General Mills.